Plankton, a term used to loosely describe the various microscopic plants and animals that float around in our oceans, is basically at the bottom of the food chain and acts as a food source to countless species of corals and invertebrates, not to mention larger animals as well. Plankton is often broken down into several different categories, with organisms being placed into each based on their size and other identifying characteristics. In the aquarium world, we tend to focus on phytoplankton and zooplankton, as those make up some proportion of a coral’s diet. Unfortunately, dosing phytoplankton isn’t exactly a popular feeding strategy among aquarium keepers. This is due in part to the fact that live plankton requires a bit of elbow grease to produce, and bottled plankton products on the store shelves aren’t exactly teeming with life. Fortunately, the guys at Aqua Medic have a nifty plankton reactor setup that simplifies the process and makes feeding live plankton to your tank a breeze. To supply reef keepers with the proper plankton foods, Aqua Medic has two different reactors, each equipped to run independently or in series with each other. The first reactor, called the Phytoplankton Cultivation Unit, utilizes an 18watt fluorescent lamp to grow the green stuff. A reflector focuses the light into the reactor, and an air pump pushes bubbles through, keeping the phyto in suspension. To jump start the phyto culture, all that’s needed is a small batch of phyto, fertilizer, and CO2. Once those key ingredients are in place, both freshwater and saltwater phytoplankton species will reproduce rapidly in the reactor, allowing for a steady food source for your aquarium or your zooplankton batch in another reactor, which brings us to our next point. The second reactor offered by Aqua Medic is a Zooplankton Cultivation Unit. 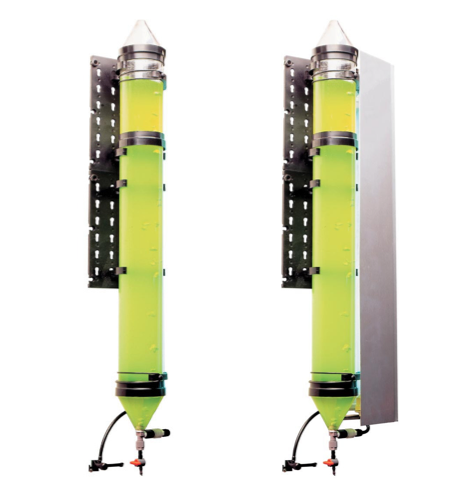 As with the phyto reactor, it can be used independently or in-line with another reactor, but the benefits of using it in conjunction with the phytoplankton unit far outweigh its independent use. Because zooplankton eat microalgae, they benefit directly from phytoplankton being trickled through their reactor. By running the reactor this way, you ensure that the zooplankton remain alive and healthy prior to feeing them to the aquarium. Besides the light and reflector attached to the Phytoplankton Cultivation Unit, the two reactors are indistinguishable. Both have a 3.2″ diameter and a 32″ overall length. Both also come with a pair of mounting brackets that firmly secure the reactors to the wall. The phyto and zooplankton reactors may not be for everyone, but we could certainly see their value on an azoox (non-photosynthetic aquariums), breeding setups, and large display refs with a high coral load. In fact, these setups have been used in college experiments and research projects in recent months.